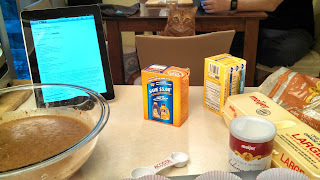 Jennifer's 365 Project: 1678/365 - Baking! Tomorrow is Chris's birthday and this year instead of a giant cake, I'm turning it into cupcakes. As you can see, Leki really likes to supervise anything I do on the kitchen counter.